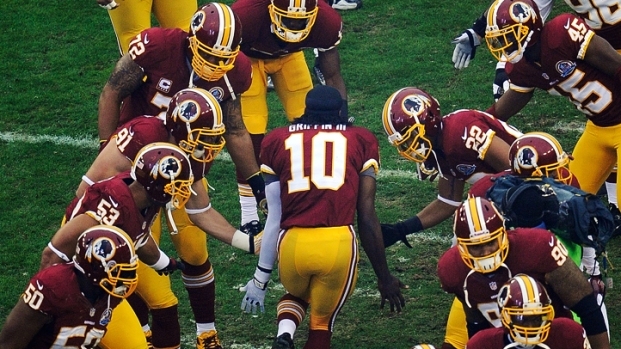 This isn't how it was supposed to end, with Robert Griffin III laid out on the FedEx Field turf late in the fourth quarter as the game slipped away while the Redskins were helpless to do anything about it. It was a weird turn of events from just hours before, when Washington jumped out to a 14-0 lead, scoring touchdowns on its first two offensive drives of the game. But Seattle went on a 24-0 run -- with 11 points coming in the final quarter -- to advance to the divisional round where they will face the top-seeded Falcons. The Redskins, meanwhile, head into the offseason with myriad questions, most of which have to do with their franchise quarterback, and their head coach's insistence on leaving him in the game. 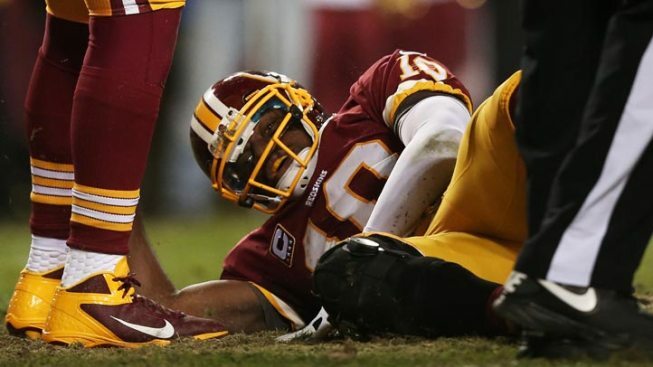 Before Sunday's playoff matchup, Washington's first since 2007, the USA Today quoted Redskins team doctor Dr. James Andrews as saying that he never cleared Griffin to return to the Week 14 Ravens game after the quarterback initially sprained his knee. "[Griffin] didn't even let us look at him," Andrews said. 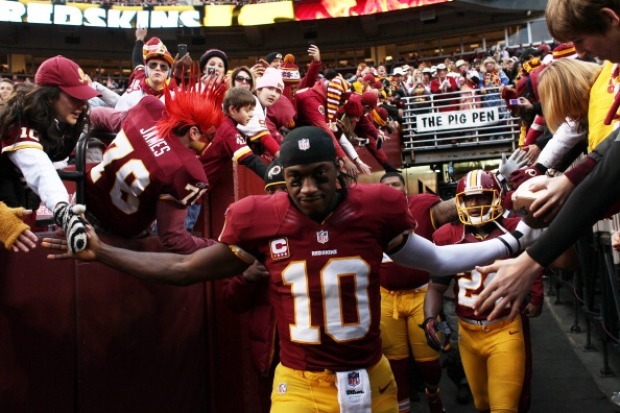 "He came off the field, walked through the sidelines, circled back through the players and took off back to the field. It wasn't our opinion. We didn't even get to touch him or talk to him. Scared the hell out of me." Shanahan told reporters a different story. "We had Dr. Andrews on the sideline with us," the coach said when asked about Griffin returning to the game. "He's the one that gives me the information. It's way over my head. I'm just telling you what he said. We felt very good with the news." So with that as the backdrop heading into Sunday's action, and with Fox's Joe Buck and Troy Aikman frequently mentioning that Andrews was nervous for Griffin, the storyline was already written before kickoff. And when Griffin was slow to get up on the second drive, everybody instinctively glanced in Kirk Cousins' direction. But it wasn't until a poor snap caused Griffin to stumble and twist his knee two quarters later that it was clear his night was over. And by then, it was already too late for the Redskins. After the game, Shanahan explained the only question anybody wanted answers to. "(During the game) I talked to Robert and Robert said to me, 'Coach, there's a difference injured and being hurt. I guarantee I'm hurting right now, gimme a chance to win this football game because I guarantee I'm not injured.' So that was enough for me," Shanahan told the media. "I thought he did enough for us this year to have that opportunity to stay in the football game," he continued. "It's always a tough decision, when to pull a guy, when not to. But I talked to him at halftime and I had to feel good about him to go back in. And I told him we're gonna run the football and you're gonna have to prove (it) to me. As I said before, he said today, 'Hey, trust me. I wanna be in there and deserve to be in there.' And I couldn't disagree with him." Fair enough. But what about the designed RGIII run around the left side in the second half that gained nine yards -- Griffin was visibly limping and unable to cut upfield for what could've been a bigger gain. "I asked him about that at the time," Shanahan admitted. "He said 'Coach, I could've run faster. Nobody was there. I get 9.5-10 yards, that's not too bad. I promise if I gotta do it again I can go faster.' So he gave me the right answer." Still, Shanahan conceded that after the second drive of the game, Griffin wasn't quite as explosive. "I think everybody could see after the first quarter that he wasn't exactly the same," he said. "But I've got a lot of players that aren't exactly the same. There's not a lot of quarterbacks that are the exactly the same this time of year. "But I still thought he could go in there and make the plays that he was capable of making against an excellent defense. You don't always have to run the football but you got to be able to sit back there and throw it and he was able to do that. He just wasn't able to scramble like he normally does. "Our medical staff said he was fine to play. Checked with the doctors and asked them their opinion if we would be hampering his LCL if we did play him or what he in good enough shape to go into the game and play at the level that we need for him to win." Shanahan was asked if Andrews was one of those doctors that okay-ed Griffin's return. And Shanahan's reaction to Andrews' being "worried" for RGIII? "I think doctors always worry anytime somebody has an injury," the coach said. "But they clear a player if they think he's able to play and we obviously take their recommendation very seriously. We would not play Robert if we thought there was a risk of him further injuring that LCL." While it's easy to paint a picture of Shanahan as a guy hellbent on winning no matter the cost, it might be closer to the truth to suggest that Shanahan wanted to believe Griffin was healthy enough to play in part because that's what his quarterback kept telling him. "Mike asked me if I was okay, I said yes," Griffin told reporters after the game. "I'm the quarterback of this team. My job is to be out there if I can play. The only time I couldn't play is when I went down. I took myself out the game. So this is the way you have to play it. And I don't feel like me being out there hurt the team in any way. I'm the best option for this team and that's why I'm the starter." Like Shanahan said: that's the right answer. Unfortunately for the Redskins, it just wasn't enough on Sunday night.